AES Rewinds specialises in the maintenance, refurbishment and repair of industrial equipment. We’ve been a trusted and respected company serving the property maintenance industry, and more, for 60 years. As experts in our field, with a wealth of experience and a skilled, dedicated team, we can accommodate all your maintenance, repair and service requirements. Therefore, removing the worry of costly machine ‘downtime’. Our workshop houses the most sophisticated tools available. As a result, we’re able to assist you in keeping your valuable equipment and business in fully operational mode. Where possible, if we cannot fix your machinery on site, we will transport it to our workshop. There we can source the right tools and parts to fix the issue while you carry on with day-to-day operations. Pumping Stations – We offer comprehensive, bespoke maintenance packages that include submersible pumps, level sensors and control systems. 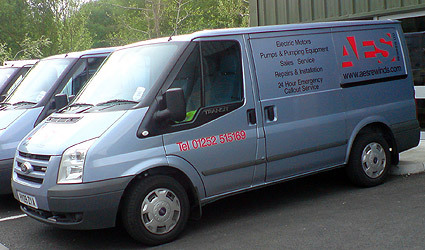 We carry out inspections to check for faults and can also include tankerage for a sewage pumping station. Sewage Treatment Plants – We provide individual service and maintenance packages for sewage treatment plants. Plus emergency callout service solving blockages, switch failures, valve problems and electrical supply faults. We can also include regular water sample testing (via a local certified water lab). This checks that the right levels are being maintained within the system. Water Boosters – Individual maintenance packages for water booster sets help to ensure your equipment is performing at its best. We also carry out essential inspections, water testing and chlorination and any necessary actions for all situations or building types. This ensures compliance with all government Health and Safety legislation to give you peace of mind. Oil Water Separators – As well as individual maintenance packages, we also offer a 24/7 emergency callout service. We provide reassurance that your equipment meets required guidelines by ensuring that hydrocarbons are separated from rainwater run-off and therefore avoid groundwater pollution. Here at AES Rewinds, we offer a comprehensive service and therefore cover most incidents and situations within the maintenance, refurbishment and repair of industrial equipment. However, if you are faced with a situation or need help that you cannot see here, do give us a call as it’s most likely we will be able to help. And in the unlikely event that we can’t, we will undoubtedly know who can. Whether a regular maintenance visit, an inspection or an emergency callout, we can reach you very quickly from our base in Ash Vale, near Farnborough, in Hampshire. We deliver our exceptional and extensive services across outer North West London, the East of England, right down to the South East and across to the West of England. Our teams and fleet of specially equipped vehicles are ready to assist you 24/7. Call us on 01252 515169 or email us for more information on the services we can provide for you.